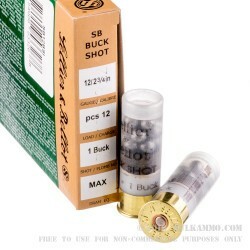 A ten round box of Sellier & Bellot #1 buckshot in a 2 ¾” shell with a 12 pellet build. This is a premium offering from the Czech Republic based maker in the home defense marketplace that also has carryover into the medium and large game hunting of game. 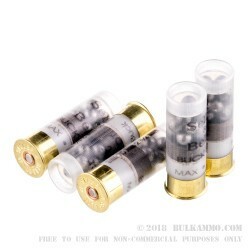 This is a very nice price point for the load considering the stopping power and the incredible S&B reputation and reliability that comes with it. Sellier & Bellot is a major producer by volume and produces over 1 billion rounds per year out of their production facilities. They are part of the CBC brand based out of Brazil and represent their most well-known brand name as a subsidiary company. 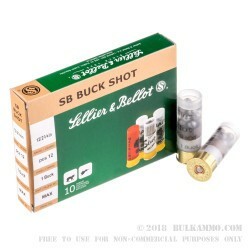 The S&B brand has been offering top tier ammunition for more than 190 years (since 1825 in the Czech Republic/Czechoslovakia) that makes them older than the extremely well known and respected brand of Winchester based in the USA. It is this longstanding tradition of offering premium ammunition and the consistency of production that makes S&B such a great company to buy from. 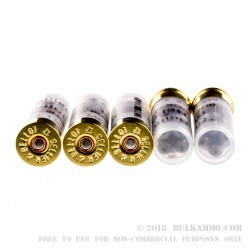 You know you are getting a proven line of ammunition with legitimate protocols in place to ensure reliability and quality.